The trucking lobby will push for Victoria and Queensland to follow the lead of New South Wales in scrapping stamp duty on new trailers and offering registration rebates. Fresh from what it says has been a two-year battle to get New South Wales to play ball, the Australian Livestock and Rural Transporters Association (ALRTA) says other governments now need "to make progress on these overdue reforms to stamp duty". ALRTA President John Beer also wants Queensland and Victoria to follow New South Wales by providing a 50 percent registration rebate to operators with spare trailers who own one or two prime movers or rigid trucks and up to five trailers. "After working with the New South Wales Government for almost two years in order to secure these reforms, the rural transport industry will now be asking other states to match New South Wales’ leadership," Beer says. He says the group is delighted with the government’s plan to offer discounts to operators with excess trailers. "This is a particular problem in the bush. 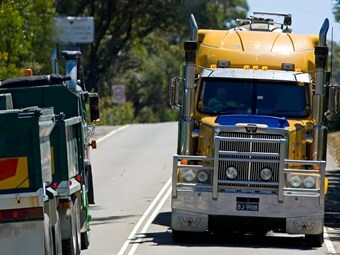 The local carrier in a small country town may be a bloke who owns just one prime mover, but he may have to own a flatbed trailer, a grain-tipper, a stock-crate and maybe even a tanker in order to do all the jobs that local businesses and farmers need done," Beer says. "At the moment, in eastern Australia, that bloke has to pay full rego for each of those trailers even though it’s not physically possible to use them all full-time. That’s thousands of dollars for trailers that are parked up on standby for most days of the week." Beer says a discount for operators with spare trailers is already in place in Western Australia and Tasmania. "The rural transport industry will now ask Queensland and Victoria to consider similar arrangements," he says. The rebate for New South Wales operators is part of an assistance package announced yesterday that includes a full refund for truckers registering tri-axle dollies and a 50 percent discount for those with tandem-axle dollies. All rebates are expected to begin on September 1 and will be available to operators who have registered or will register their equipment before then. The New South Wales Government needs to amend the Duties Act to end stamp duty for new trailers. Parliament must approve the change before it takes effect.